Forty years of marriage have gone by and the big day is dawning. A ruby wedding anniversary is not a day that should go by without a celebration. Read on and get some great gift ideas. If you have managed to stick together through thick and thin through good and bad times, you should celebrate with a dramatic gesture. Dramatic gestures are often expensive and come from exclusive stores and in this context we are of course talking about jewels and jewellery. The very best companies put together special pieces for couples like you. They design rings, bracelets and necklaces that are designed to commemorate the time you have spent together. 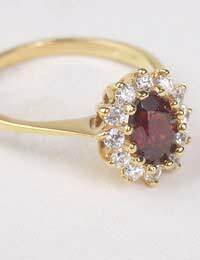 Rubies are obviously the stone that should form the centerpiece of these items so whatever you go far; ensure that at least one ruby stone is present. A ruby ring, a pair of cufflinks featuring the stone or pair of stone-encrusted earrings are top choices! We don’t need to tell you that forty years is a long time. Over the last decades the happy couple must have visited a few memorable places and had some amazing times. But the adventure doesn’t have to stop here. Why not create some new memories? If you are the happy couple or if you are the one buying a gift for the couple, treat them. Have they ever mentioned a place that they would love to travel to? If it is far away, buy some travel vouchers that can go towards the cost of getting there. Alternatively, if you are feeling generous, go ahead and book them a seat on the plane or train and make the dream happen. The above presents are all very nice but they might be out of your price range by a few hundred and the happy couple may not actually want these gifts. There are plenty of more reasonable gift ideas out there that will still be appreciated. For example, you can’t go wrong with a bottle of champagne and what’s even better than that? A new set of glasses to drink from. Get a set of ruby glasses – they could be ruby glasses or ruby encrusted, it all depends on the type of budget you have to follow. If the happy couple has a good sense of humour you can get them a fun present. Recreate a newspaper headline from forty years ago. There are plenty of companies out there that will allow you to recreate this – supply them with a photo and the details of the couple and let them work their magic! This is a memento for them and a unique gift idea. A photo album or a photo frame with a picture of the couple is a good present idea. A photo album is a particularly good option. Buy a special wedding anniversary version that allows you to insert plenty of photos and captions. Then consult with family and friends to supply you with a collection of images from the last forty years and beyond. Add funny captions and you have a truly special gift. It may not have cost you financially but the pay off will be huge. Everyone will see the effort you have put in and the album is something that money just could not buy. Forty years of marriage is a huge deal and it needs to be commemorated in some way. Whether you plan a special party or a special gift do all you can to make the day memorable.